The Highlight Film Evaluation Test Stand is the most advanced method to test and evaluate stretch films. It provides performance information and allows for quick comparison of films to understand performance differences. 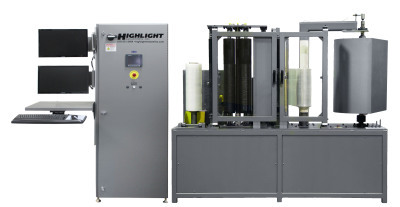 The Highlight Test Stand is used in the laboratory by stretch film manufacturers and resin producers to test films and to improve both film performance and profitability. Damaged loads cost money, waste time, and can ruin business relationships. Ensure your loads are wrapped properly to arrive safe with Highlight's Transportation Simulation System (TSS). 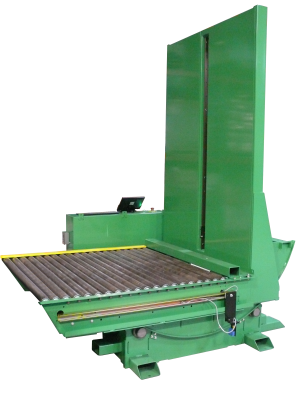 The TSS provides accurate replication of load transit behavior using horizontal impact and sustained tilt testing. The effects of these tests are monitoed and recorded using lad accelerometers and a laser profile scanner. Highlight Industries has specialized in testing the mechanical properties of stretch film, and designing and building test systems for over 25 years. Test the security of your loads to ensure that they arrive at their destination safely. 18 independently adjustable wrap settings, including an electronically controlled pre-stretch level which can be entered by touch screen from 0–600%, make this machine smart enough and versatile enough for laboratory testing of films. The all-steel construction, "over-engineered" drive and control systems, and use of industry standard components, make the Synergy 4 tough enough to stand up to decades of hard use. Pairing the Synergy 4 Stretch Wrapper with Highlight's Transportable Test Pallet creates a complete system for testing real world application of film's containment force, puncture resistance, and retention force as it is applied to a load.